it Needs From the Foods You Eat? It is well understood that farmland soil has much less of the essential minerals today than it used to and that people no longer get anywhere near sufficient quantities of the needed nutrition from food. The nutrient quantity in food has been continuously decreasing over the years due to modern farming techniques, processing, transportation, as well as the concern of food producers to make the food look good on the shelf rather than being concerned about the quality of the food. These factors, combined with poor food choices and imbalanced diets, all contribute to an inadequate intake of vital nutrients. 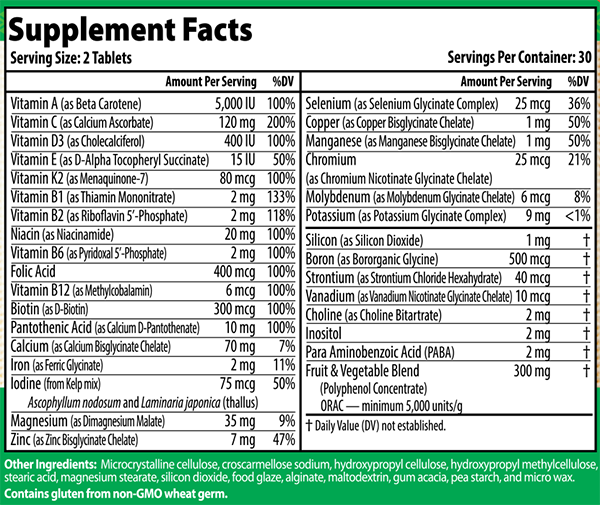 Getting additional vitamins and minerals (supplements) is essential in the modern world. There are, however, significant differences in the quality and efficiency of different supplements. Why Use Life Support for your Daily MultiVitamin Needs? Firstly, we have some of the most highly bioavailable and bio-active forms of the vitamins and minerals you need on a daily basis in our formula! All of the minerals in our RHP® Life Support Formula are chelated minerals from Albion®, who is a recognized leader in creating chelated minerals. Here is a link to their website where they describe the Albion® Difference. Vitamin E (as D-Alpha Tocopheryl Succinate) is a natural form of vitamin E which has had clinical research done on it. Not all biotin is the same. D-biotin is the naturally occurring, biologically active form of the B vitamin biotin. It's involved in lipid, protein and carbohydrate metabolism. Foods rich in biotin include eggs, dairy products, peanuts, almonds, walnuts, cauliflower, avocados and raspberries. And finally, our Fruit and Vegetable Blend sourced from France provides you with a superior antioxidant. The Fruit and Vegetable Blend delivers a similar amount of polyphenols as the amount measured in 5 servings of the most consumed fruit and vegetables, a 19% difference as assessed by analysis, the Fruit and Vegetable Blend shows a significantly higher antioxidant capacity, an 82% increase, as assessed with the ORAC 5.0™ assay*. The RHP® Life Support Formula is a Daily MultiVitamin that contains a complete balance of vitamins, minerals and antioxidants. It is designed to provide your body with complete and balanced nutrition using ingredients that build a foundation for good health. 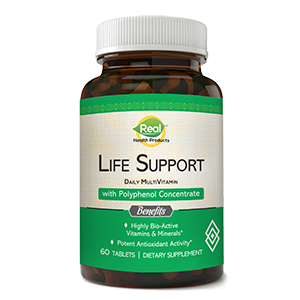 RHP® Life Support Daily MultiVitamin is better absorbed, utilized and retained by the body because the ingredients are highly bio-active and bioavailable. Your body recognizes and can use them. We're so sure about the quality and effectiveness of the RHP® Life Support Formula that we offer a full 90-day money-back guarantee on the initial order. A 30-day supply is just $38.70. Use the RHP® Life Support Formula for three months and you'll notice the difference! Order the RHP® Life Support Formula Now! Albion® is a registered trademark owned by Albion Laboratories, Inc.